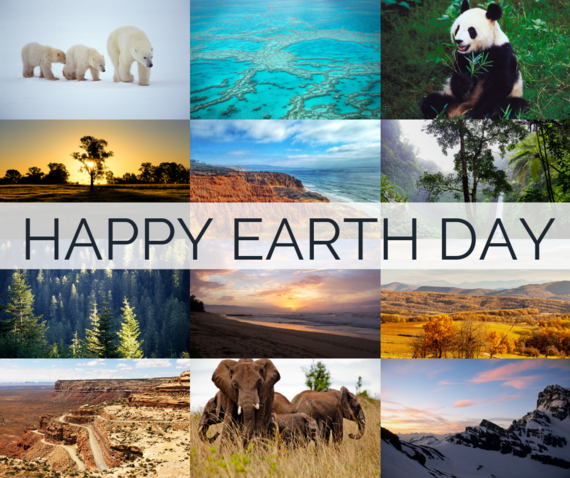 Earth Day celebrates our planet and recognizes the importance of safeguarding it for future generations. We also must confront the threat of climate change and take collective responsibility to protect our air, water, wildlife, and natural resources. I disagree with the president's decisions to withdraw from the Paris Agreement, defund the EPA, open our coasts to drilling, and more. However, I still believe we can restore American leadership on climate and I’m fighting to make that happen. Supporting the transition to a clean energy economy. This year, I’ve worked to curb climate change as a member of the Energy and Commerce Committee and the subcommittee on Environment and Climate Change. Thankfully, the committee had the first hearings on climate change in six years and our work is just beginning. I asked how the federal government can accelerate the deployment of clean energy technology and support workers as we transition to a clean energy economy. Funds to mitigate the Tijuana Sewage spill. San Diego is defined by our relationship with the ocean, so I’m also working to keep our beaches and bays clean. 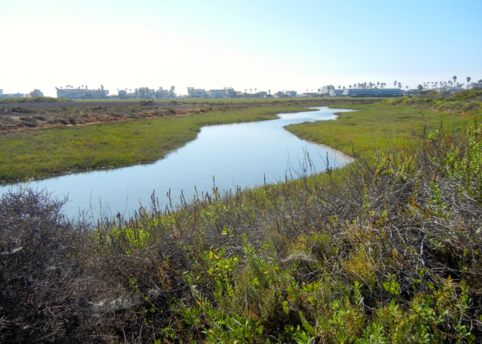 In February, I worked with Reps. Juan Vargas and Susan Davis, with help from Senator Feinstein, to secure $15 million from the EPA to address the ongoing sewage spills into the Tijuana River. Immediate action to address climate change. I also released The Climate Playbook, a comprehensive plan to take immediate action to address climate change. It outlines how to reach targets like reduced emissions, increased resiliency, and energy efficiency by passing bills, which are mostly bipartisan and therefore, can feasibly become law. I look forward to working with my colleagues, experts, and our communities to identify and solve distinct challenges posed by climate change. It’s more important than ever for us to ensure we leave the next generation with a clean and sustainable planet. I’ll continue fighting to curb climate change and protect San Diego’s beautiful beaches, bays, canyons, and trails. I hope you will celebrate Earth Day by doing something today to make our planet more sustainable. The threat of climate change and its effects are undeniable and scientists warn that to avoid catastrophic consequences, we must reduce our emissions and become carbon neutral by mid-century. The new Congress has a new opportunity to make a difference, and we don’t have to start from zero. 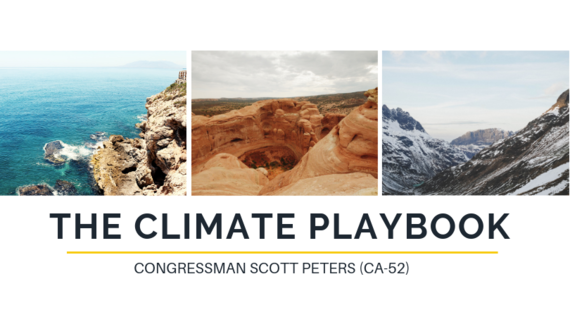 I unveiled The Climate Playbook– a compendium of bills Congress can act on now to take immediate steps to reduce greenhouse gases to slow and reverse the effects of climate change. It proposes specific legislation to reduce emissions, invest in adaptation and resiliency, and improve renewable energy efficiency and standards. 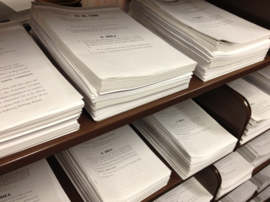 The Playbook invites input on how to improve these bills, which are mostly bipartisan and therefore, can feasibly become law, and also ideas for new bills that can be added. We’re long past the debate of whether climate change is real. It’s time to work together to act on climate now. 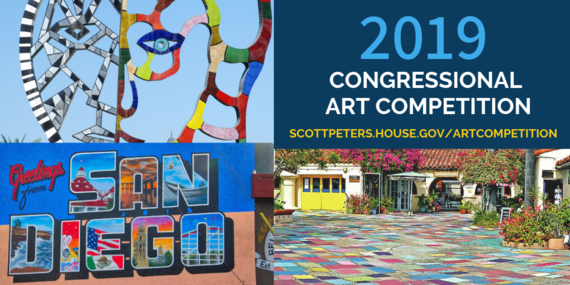 San Diego high school students are invited to enter the 2019 Congressional Art Competition. 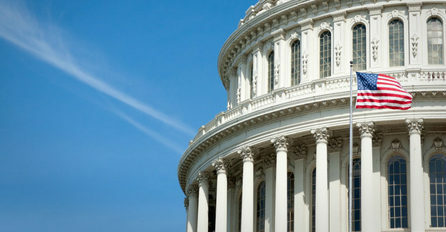 Artists can submit original pieces for the chance to win and have their art displayed in the U.S. Capitol for one year. 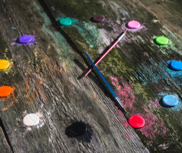 As a former board member of the Museum of Contemporary Art San Diego and a leader in the Murals of La Jolla effort, I know the arts add character to communities and build creativity, collaboration, and confidence in students. I hope the Art Competition encourages students to explore their creativity in a way that will foster a lifelong love of the arts. Entries can be no larger than 26” x 26” x 4” when framed. 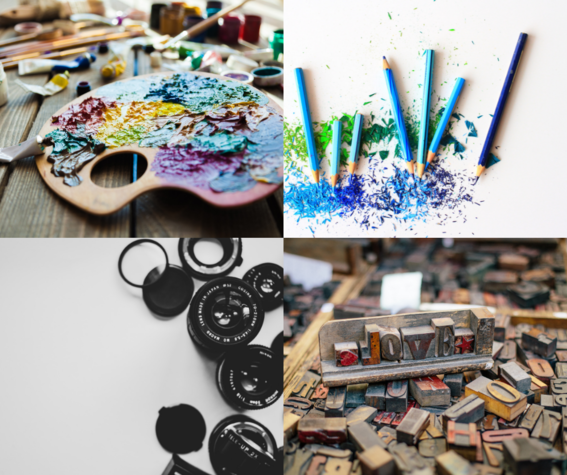 Artwork must be original in concept, design, and execution. Visit our website for more details and a complete list of rules and regulations. Artwork must be dropped off at my San Diego office by Friday, April 19th, 2019 at 4:00pm. Contact my San Diego office with questions at 858-455-5550. I look forward to seeing this year's submissions and the artistic talent of young artists. After 35 days, the partial government shutdown is finally over. It should not have lasted as long as it did, but I’m relieved the entire government is working for the people again. Some of my colleagues said the shutdown was a fight for better security, but I disagree. During the shutdown, many agencies critical to our national security and public safety closed or furloughed their employees. Some essential employees at these agencies were forced to work without pay, called in sick, or just quit. Listening to San Diegans is one of my most important jobs. I’d like to know where you stand. Share your thoughts and join my email updates. Is shutting down the government a responsible way to negotiate? I voted to re-open the federal government eleven times during the shutdown and continued to urge my Senate colleagues to pass these bills and send them to the president's desk. Unfortunately, the majority of these efforts did not advance past the House. On the first day of the new Congress, I voted for two bipartisan packages of six bills that would reopen six of the seven federal agencies closed by the shutdown. I also voted in favor of temporary funding for the Department of Homeland Security while we continued border security negotiations. On January 15 and 23, I voted for two bills to temporarily reopen the government and end the shutdown. Last week, I voted on five separate bills to reopen shuttered federal agencies based on bipartisan agreements. This ensured that government agencies dealing with tax refunds, housing and transportation, nutrition and farming subsidies, national parks, and disaster relief efforts could serve the American people. Members of Congress must do their jobs and put the American people first. It’s irresponsible to shut the government down because we can’t agree on a real budget and can’t get past partisan bickering. I helped pass the Federal Civilian Workforce Pay Raise Fairness Act of 2019 this week to give thousands of civilian federal employees a 2.6 percent pay increase – just as members of the military received this year. San Diegans who dedicated their careers to public service, especially those who are now struggling to pay bills because of the 35-day shutdown, are more than deserving of this pay raise. The shutdown may be over for now, but it continues to effect American families. I will continue to work with my colleagues on both sides of the aisle to find efficient, fact-based solutions for border security and keep the government open. Getting the government working again. In San Diego, we know real border security does not mean spending billions on a new wall that won't do anything to make us safer. 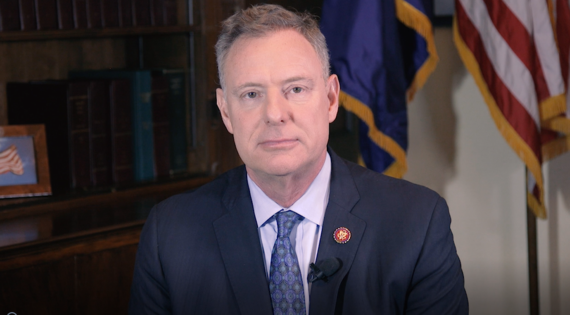 I was honored to deliver last week's Democratic Weekly Address urging the Senate and President Trump to consider sensible, cost-effective, bipartisan border security measures instead of holding the government and federal workers hostage to a wall that's never going to get built. There are bipartisan border security measures we can all support. Let's get the government open, so we can start working on them. 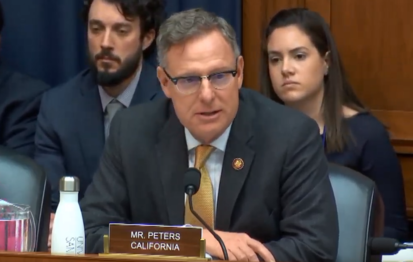 Click here to watch Rep. Peters' address. You can read more about the address in The San Diego Union-Tribune. As we conclude 2018 and prepare to enter a new session of Congress, I’m thankful to represent San Diego, Coronado, and Poway. This year was filled with both challenges and accomplishments for the U.S. and San Diego, but our region’s people, innovation, and spirit continue to drive our mission even as national headlines distract from the truth and seek to divide us. We returned $485,333 to San Diegans, who had trouble retrieving backlogged funds from the IRS, Social Security, the VA, and more. In all, our office helped 579 San Diegans navigate federal agencies, get answers, and find a solution. 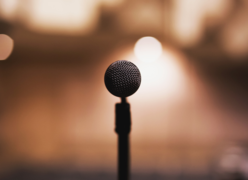 If you can't get an answer from a federal agency in a timely fashion, or if you feel you have been treated unfairly, you can contact my office for help. While we cannot guarantee you a favorable outcome, we will do our best to help you get a fair and timely response. We answered 52,381 of your calls, letters, and emails about issues important to you. 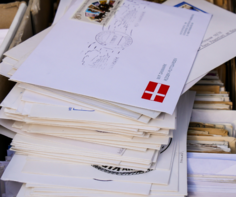 Every letter, email, and call is read and answered because I want you to feel your voice is heard and to know where I stand. Your input is always welcome. We attended 381 community meetings and events to update you on our work in Congress and to hear directly from each part of the district. We also presented 1,170 certificates to San Diegans making a difference in their communities. 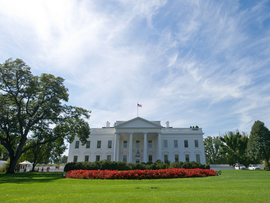 We arranged 1,001 tours for San Diegans visiting D.C. and I hope you’ll let us know if you’re ever in town. We introduced 9 bills and resolutions and cosponsored 161 more. You can sign up for legislative updates, based on the issues you care about here or visit my website for the latest news. I hope you’ll keep in touch in the new year. 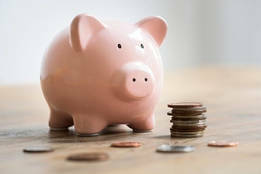 Please do not hesitate to call our San Diego office at (858) 455-5550 or our Washington, D.C. office at (202) 225-0508. You can also follow me on Facebook and Twitter for the most recent updates. I am honored and humbled to serve in Congress on behalf of San Diego, and I am looking forward to seeing all we will accomplish in 2019. All Americans deserve access to quality, affordable health care. During Open Enrollment, I want to make sure San Diegans have the resources and information they need to find the right heath insurance and get covered for 2019. Open enrollment is happening now through January 15th, so now is the time to compare plans and purchase health insurance for 2019. For coverage starting January 1st, be sure to sign up by December 15th. Visit www.coveredca.com for more information on how to enroll for 2019. 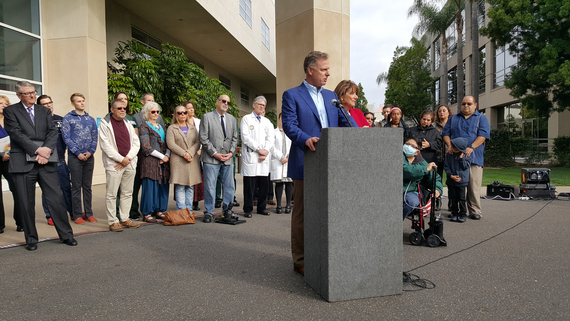 I’m working to make health care more accessible and affordable for families, which means rejecting reckless proposals that would leave thousands of San Diegans without coverage and fighting for bipartisan health care solutions that keep premiums down and stabilize the markets. I look forward to continuing this fight next Congress. 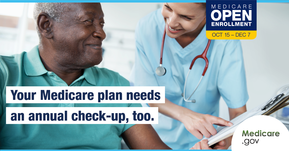 San Diego seniors are eligible for Medicare Open Enrollment, happening now through December 7th. Even if you’re happy with your coverage, take the time to explore the options available to you to find a health care plan that meets your medical and financial needs. I encourage San Diegans to contact my San Diego office with questions about Open Enrollment. My staff can help connect you to representatives at the Centers for Medicare & Medicaid Services and Covered California to get you the information you need to get covered. It's deeply troubling that our service men and women might return home from battle only to take their own lives because they are tortured by something they experienced during their service. I asked the Department of Veterans Affairs (VA) how they are working with the Department of Defense (DOD) to curb veteran suicide during a meeting of the Veterans' Affairs Committee. I was joined by the Somers family from Coronado, who lost their son, Daniel, to suicide after he suffered post-traumatic stress (PTS) following his service in Iraq. They are now tireless advocates for fixing and reforming the broken health care system at the VA. The National Director of Suicide Prevention for the VA said they would like more information from the DOD about risk factors for suicide. The VA could identify mental health issues sooner if they had access to information about servicemembers’ promotions, disciplinary action, and family support systems. I also asked what kind of outreach was being done for veterans with other than honorable discharges. Only 115 servicemembers nationwide are enrolled in suicide prevention programs specifically tailored to them, and the VA agreed more outreach was needed. San Diego has the third largest population of veterans in the country, many of whom are battling mental health issues. Veterans who have experienced homelessness in the last year are particularly at risk, with suicide rates almost double those of veterans without a history of homelessness. 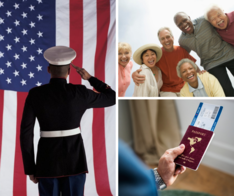 We’ve made progress with the HUD-VA Supportive Housing (HUD-VASH) program, which assists San Diego veterans in their search for affordable housing, but there is still work to be done. I will continue fighting for mental health care and homelessness services for San Diego veterans and will work with both the VA and the DOD to find solutions that ensure we don’t lose another veteran to suicide. 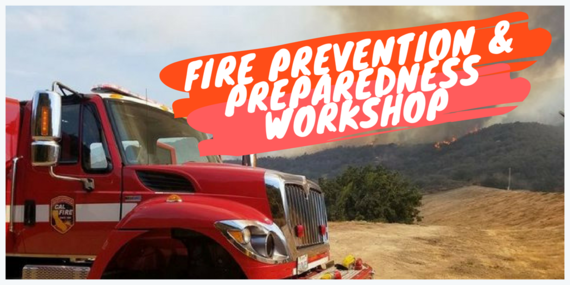 Join Rep. Scott Peters at his workshop to make sure you and your family are prepared for wildfire season. Hear from local organizations and government representatives, who will share resources with the La Jolla community to create an evacuation plan. View and download the event flyer. 6:00 p.m - 7:30 p.m. The geography of La Jolla lends itself to fire spreading. The combination of steep canyons and thick brush increases the potential for wildfires to engulf the canyons and Mount Soledad. The San Diego Fire-Rescue Department recommends having two ways out in the event of an emergency. San Diego communities, like Scripps Ranch, have created a community-wide evacuation plan. Join us to find out how your community can create your own plan. For more information, contact my San Diego Office at 858-455-5550. Do you like to code? 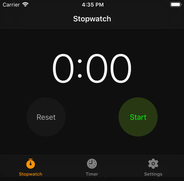 Have an idea for a new app? 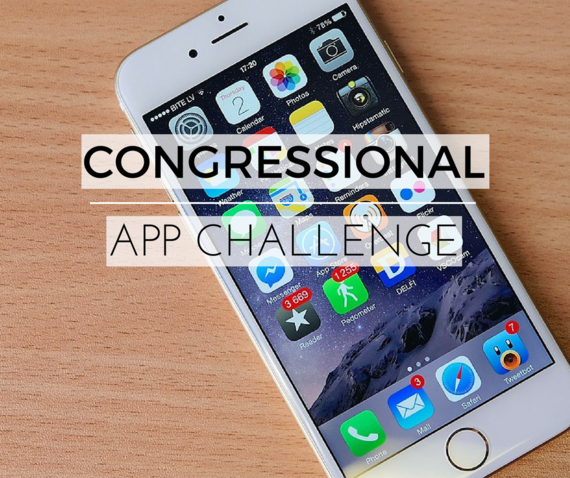 We’re inviting students who code, program, or love computer science to design a software application and enter it in the Congressional App Challenge. The App Challenge encourages student participation in STEM subjects, so they can be better prepared to fill the jobs of the future. San Diego has some of the best leaders in science, technology, engineering, and math. Our city has become a global force in innovation thanks to our investments in these fields—and the most important investment we can make is in the next generation. You can compete as individuals or in teams of up to four. Submit your app along with a short video explaining the app and what you’ve learned throughout the competition process. Visit my website for more details and a complete list of rules and regulations. The entries will be judged by a panel of local judges, who work in San Diego’s academic, technology, and entrepreneurial fields. 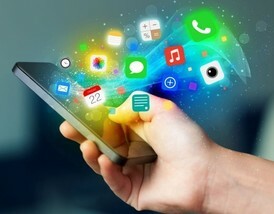 The winning app will be featured on the U.S. House of Representatives’ website and displayed in a U.S. Capitol exhibit along with the winners from other states and districts. Submissions are due October 15, 2018. Padraig MacGabann of Coronado High School won last year with his impressive submission, Rescue, an emergency response app designed to contact first responders more efficiently and to provide important details about the emergency. I look forward to seeing what apps San Diego students come up with this year. Good luck, and happy coding!